Posted on January 31, 2019 by Tish Farrell	This entry was posted in Gardens and tagged frost, Tish Farrell Writer, Winter Garden. Bookmark the permalink. Thanks, Mike. Glad you like the header too. That first shot is absolutely beautiful! 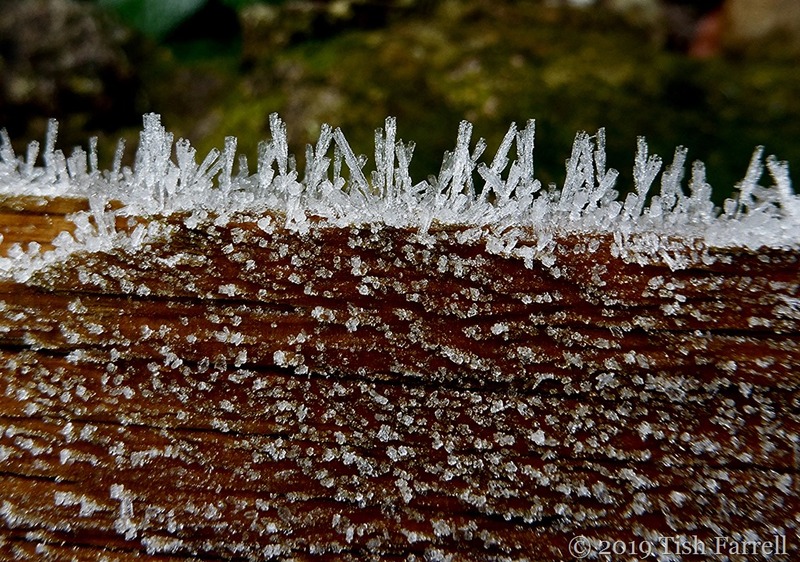 In SoCal, I’m not familiar with hoarfrost, so this is very exciting to see! Thank you for sharing it! I’ll try blowing a little extra hard to see if I can send some warmth your way. It’s actually just starting to rain for the next 4 days, so maybe I should wait till that ends! I see it was snowing a bit at Anfield, last night. I suppose I won’t win any friends if I tell you I am sitting in T shirt and shorts with the front door open. Hah! It melted in mid-flight! Your captures are a true tribute to Mother Nature’s beauty. Thank you, Janet. Hope you’re keeping warm too. Ah – it does not get more beautiful, does it! Fabulous patterns and wonderful photography, Tish! 🙂 🙂 Brrrh! On with the balaklava. It was flipping cold on the fingers taking those photos, Jo. Better today though. Tea and books and all cosy at home, that sounds ideal Janet. Take care in all that snow and coldness. What a beautiful perspective, Tish! Perhaps we could arrange a flight for Air Force One from Chicago to Melbourne and then maybe their might be some appreciation for the reality of climate change in the extreme! Not sure that anything – especially reality – penetrates these nay-sayers’ skulls. Too much else on their agendas. A perfect accompaniment to Adam Gopnik’s “Winter: Five windows on the season”, which I’ve just read a sample of on Kindle. Hi Meg. Now that sounds an enticing title, and maybe an antedote to baking temps. in your part of the world? An ineffective antidote! The best one I know is cooler weather. We weren’t by any means the hottest, although 35° felt like it I must say. It’s not 45° – for which we were deeply grateful. I have a jacket on now – inconceivable this time last week. It has its good points as long as you have enough sweaters and woolly socks. Thanks, Widdershins. There’s still time for more wintery stuff though, isn’t there. No casting of clouts for a month or several. 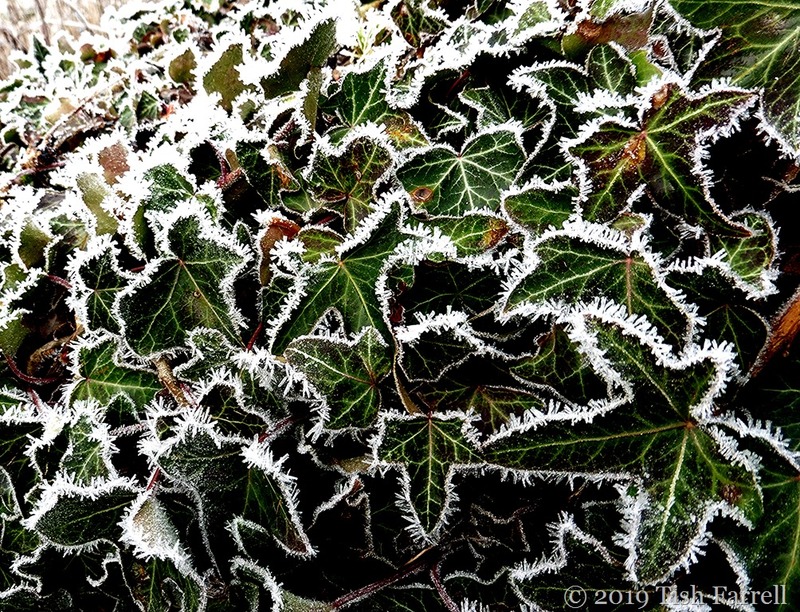 There is something so appealing about frost rimed leaves and those ivy leaves are wonderful with the shape and the texture. No frost here and only a smattering of sleety snow. Can’t say I’m sad as I don’t want to lose any of my rather tender plants! It’s been v. cold in Shropshire these last few days, though set to warm up next week. I can’t believe how tenacious some plants are being. The hesperanthus still seems to be going – frosted or not. That is one determined flower! oh Tish – that iced Ivy almost seemed like something a craft store would sell for decor. I looked at it a few times and what a fun thing to capture with your camera. so nice…. I did think it might make this year’s Christmas card. Then I thought: No, no, no. Far too soon to think of Christmas. It’s pretty when it comes with a blue sky!